What is a fuel briquette? 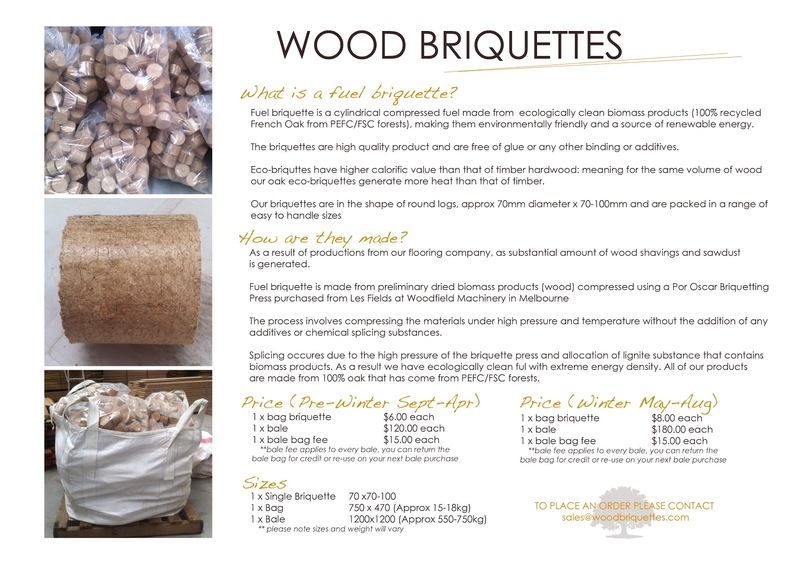 Fuel briquette is a cylindrical compressed fuel made from ecologically clean biomass products (100% recycled French Oak from PEFC/FSC forests), making them environmentally friendly and a source of renewable energy. The briquettes are high quality product and are free of glue or any other binding or additives. Eco-briquttes have higher calorific value than that of timber hardwood: meaning for the same volume of wood our oak eco-briquettes generate more heat than that of timber. As a result of productions from our flooring company, as substantial amount of wood shavings and sawdust is generated. The process involves compressing the materials under high pressure and temperature without the addition of any additives or chemical splicing substances. Splicing occures due to the high pressure of the briquette press and allocation of lignite substance that contains biomass products. As a result we have ecologically clean ful with extreme energy density. All of our products are made from 100% oak that has come from PEFC/FSC forests.